Dalton Gin Bar is a place specialized in crafting cocktails with gin that offers an encounter between mixology, fine music selection and unique service, all of this, is located in the terrace of one of the most important buildings of the area, with an astonishing view of the historic downtown of San José del Cabo. 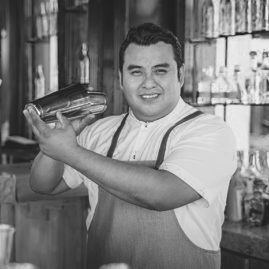 Mixologist and beverage director of Chileno Bay in Los Cabos, México. He joined the team after had worked in different executive positions in a few luxury developments in Los Cabos, including Nikki Beach, The Resort at Pedregal and The Cape a Thompson Hotel. In 2015, Vázquez was one of the winners of the international contest “G’Vine Global Bartender Challenge”, with his original cocktail recipe inspired in the creator of the color television, Guillermo González Camarena. Currently is partner and beverage director of La Revolución Comedor de Baja California and Dalton Gin Bar.